Welcome and congrats because you have it the easiest out of anyone. Your standard edition(SE) or collector's edition(CE) will come with exactly what you see here. If you pre-ordered the game then you also receive a Moogle Hat and Cait Sith minion(in-game bonus items) as well as 3 day early access. The bonus items are sent to the account when you register a code and the code is valid until the end of the year. The early access is activated on your account through your registration code for PC users or a promotional code for PS3 players. Follow the instructions you should receive(if you haven't already) in an email from Square Enix*. * PS3 Users: If you purchased through PSN, your early access and items will already be active. Also note that when you receive the disc there are two codes that come included, one on the back of the booklet and one in a leaflet. The code on the back of the booklet is what you use to access the download and the one in the leaflet is what you use to upgrade from a temporary early access account to a fully registered account. If you participated in the last phase of beta, you will simply need to update the client you already have to begin playing for early access and launch. Follow this link for information on how to transition from 1.0 to 2.0 if you were not a part of early access. You will be able to download the client for ARR with no charge associated. You are also getting a 14 day trial period to play the game before you will be asked to subscribe. If you purchased the CE of FFXIV during version 1.0, you be able to download the client for ARR with no charge associated and you will get the non-physical bonus items (Helm of Light, Coeurl Mount, Behemoth Bardling and Baby Behemoth minion) from the newer ARR CE. Last I heard they will be received through the delivery moogles with no registration codes necessary. Please, please, please be aware that you can only register ONE version per platform to your service account. Essentially, this means that if you registered 1.0 to your account, then you have already used the only PC registration you are allowed for this account. You're not completely shut out of upgrading your SE to a CE and you can do so by purchasing the digital download of the CE version*. * Square Enix has mentioned that there will be a digital upgrade for PC users that will upgrade a standard edition 1.0 account to an ARR CE account allowing you to receive the bonus items. This info comes from Camate, but as of 21 Aug it is not yet available for purchase via the Square Enix store. You will already be granted access to the in-game bonus items so the only real reason to purchase the ARR CE would be to obtain the physical items. Perhaps you want to multi-box a second account as a bonus as well. All you need to keep in mind is that you are only allowed one platform registration per account and make your purchase accordingly. The PS3 CE is slightly more expensive than the PC version so it may be in your best interest to purchase the cheaper of the two depending on what you intend to do here. The code you need is NOT the 20 digit code you generated from your 18 digit code. This was just for early access. If you go into account management you will likely see you only have 4 free days remaining. Go to Amazon , log in and access your video game library. There will be a hot button to get your actual product key. Go to your account management at Mog shop select services, click on the add icon, enter the new 20 digit code and voila it will update to CE edition. For those of you who pre-order the physical CE - DO NOT ATTEMPT TO REGISTER YOUR GAME YET! I don't have the source link, but I'm certain that I read an official post from SE stating that ARR CE players would be receiving their items at the end of early access. "But Filth, early access was from the 24th to the 27th. You be trollin!". Certainly not. SE states that the period of early access started on the 24th, but will run through launch until Thursday, August 29th 11:59 PM. "So what the hell? Why does early access overlap the launch date?" Well, here is where my speculation comes in. I'm thinking SE realized that people who pre-order might be purchasing the physical copy of the game. In doing so, you run into the possibility that games might not reach the players in time for them to register right at launch. SE decided to extend the early access through the 29th to make sure that everyone has their physical copy in time to register their code. "Filth, have you not been reading the forums. SE isn't looking out for us. Why would they have devised such a brilliant plan?" Here's where SE herps the derp. I think what they did was set up the temporary early access service account to automatically expire on the 30th. My theory is that your account will expire(at which point you'll be booted from the game and fire off every curse you can at whoever is closest to you), you will login to the Mog Station and be greeted with a message saying something to the effect of "Your temporary early access service has expired. Please locate the manual from your physical copy of ARR and enter your registration code". Doing so will likely result in your temporary early access account upgrading to the standard or collector's edition depending on the code registered. I'll be keeping an eye out for more information, but for the time being I would advise that you not attempt to register any codes for the physical copy if you were a part of early access. The only cases I have heard where people were successful resulted in them creating a brand new service account. Doing so results in the temporary account having early access items(and likely your character progress) and the new account having CE bonus items. That is not what you want and will require you either fill out a form and wait several days for resolution, or sit on the phone(possibly for hours) with customer service while they escalate your call. In order to participate in Early Access, you must either be a legacy member or pre-order the game. Owners of the 1.0 CE are not eligible for early access unless they meet one of those requirements. 1) Visit http://preorder.na.finalfantasyxiv.com/ and select your language. At this point, the pre-order items and early access should be activated on your account. If you receive an error message it means that the process did not complete properly so reload the page(Ctrl + F5) and keep trying. 1) Log into your PSN account on your PS3 and on the XMB go to Redeem Code. 2) On the card inside your case labeled "Registration Code" (the purple and white one), enter that and redeem that code. Download the game if needed. 3) Now, go to your browser on your PS3 or your PC and go to http://member.square-enix.com/na or http://goo.gl/MFGjTp if it 404's like it does for me (I'm using the latest build of Chrome and for whatever reason it 404's every time I enter that in). Log into your SE account. 4) In the top right corner hit your account name, and then hit My Profile in the drop down box. 5) Towards the bottom it'll say Registered Games: # -- hit Add New Game below it and register the code on the card that says Product Registration Card (the black, red, and white one that's like a little half card inside the case). This'll register the product onto your SE account. (why this is a two stage process, I'll never know). 6) You'll notice that not a damn thing has changed except the product is registered. Your Mog Station will still say you have no subscription, etc etc. Go back to your PS3 and log into the game. Now and only now will it ask you to register the actual FFXIV service to your SE account. 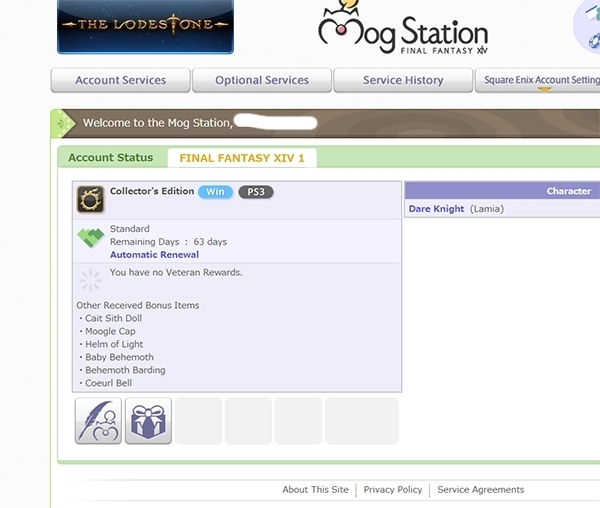 Once you accept the terms and conditions and add the game as a service, you can manage it online at the Mog Station. I don't know why it took all that for me to register my game, I've been fiddling with it for over 45 minutes. But that's what needs done to register your PS3 copy of the game, get your bonus 30 days, and manage it at the Mog Station. "No valid or active service account is available to play FINAL FANTASY XIV: A Realm Reborn. Proper registration through the FINAL FANTASY XIV: Mog Station is required. * Users participating in early access must also complete registration by August 30, 2013. Using the code enclosed with your package, please complete registration through the FINAL FANTASY XIV: Mog Station." PS #2: If you add the Windows Digital Download from here, you will get an ADDITIONAL 30 days of game time, and for $19 more you can upgrade to the CE. AFAIK bonus time counts towards the subscription time for the bonuses coming up. Open the launcher. It will update and then ask you to accept terms and conditions. Then log in with your Square ID and password. 1) Login to the Mog Station. 2) Click the 'Account Services' button at the top left of the page. 3) Look for a button that says 'Reactivate Service Account'. This should be found just below the window where bonuses are listed. If you do not see that button then you should contact SE Customer Support. 1) If you haven't already downloaded the launcher, download it and open it. Special thanks to everyone contributing to this thread. The idea is to make the process as quick and painless as possible so if you find any new information or you find that the information I have here is incorrect, please let me know(provide a link where applicable) and I'll verify and update it. I'm sure this will help quite a few confused people. Good post. Good breakdown. The SE versions read like income tax instructions. add the ps3 psn stuff also and that we got the pre-order items as well. Could you be a little more clear? I'm not sure I understand what you mean. So do SE 1.0 players get the early access? Does upgrading to CE give early access? Does preordering also come with a free months subscription, as compared to the 14-day free trial for not? All good questions. I'll answer here and update the thread. A) 1.0 players only get early access if they are legacy members or if they have pre-ordered ARR. B) Upgrading to CE does give early access, but only if you pre-ordered the CE. C) Any new version regardless of whether you pre-order or buy it in the store will come with a 30 day trial period. Actually I think I had that covered.. The early access is also activated on your account through your registration code for PC users or a promotional code for PS3 players. Riots, moogles being burned in effigy, mass hysteria...you know, the usual for a launch. FilthMcNasty - are you still around? Lol! Well, awake? I am probably going to sound like an idiot, but was wondering if I can throw my scenario at you for you to decipher? Okay, I'm 1.0 CE. Someone who USED to be a trustworthy source told me I still had to pay for the game since I wasn't legacy, so I purchased the $30 digital download. Do I still get my 2.0 CE items if I redeem my pre-order for EA and bonus items? The 2.0 CE items are account based so as long as you still have access to that account(and assuming you've been good to the moogles), they should have the items to be delivered. The only thing you need the pre-order for is the separate pre-order items and early access. Does that clear it up? I love you so much. I was SO confused. I thought I was going to have to pick between one or the other after I already had paid the money and of course I want both. Thanks, You saved me a launch day headache! I was trying to pre-order the PC Collectors and add it to my 1.0 account where i had a PC code already. The crap thing is, the PS3 collector is twice as much and twice as rare. You might have to take that back. You ordered a PC version of the game if you got the digital download. You'd have to get the PS3 version to register the items to the same account. Sorry I read you wrong. The reason it's so jacked up is that the registration process for both platform are different. PC uses normal registration while PS3 uses promotional codes. Noooooooo. x_x; Don't tell me that. LOL. Okay, so I do have to pick one or the other. Or try to somehow return the PC version and get the PS3 version. Sorry but this got me more confused, i thought you can register multiple service account on your Squenix ID as stated on their website? Has this been changed? Cause my GF got me got the preorder CE to upgrade my 1.0 SE... this is not going to end well for me if its? Oh gosh, that link really confuses me. This whole thing is making me feel like I fit the blonde stereotype. I submitted a cancel for my digital download. Here's to hoping they will do it. -_-; I ordered directly from Square. The link you provided deals with multi-boxing. Bear in mind, there are two different 'accounts' they are discussing in that link. One is the Square Enix account and the other is a service account. You can go right now and create a Square Enix account without owning any of their games. When you purchase and register a game(either FFXI or FFXIV), you create a service account for that specific game which is linked to your Square Enix account. Each copy of the game you register requires it's own separate service account. Think of it kinda a bank account. You get a username and password for your bank's webpage and once you access that, you see all of the other accounts linked to that like checking, savings, investments, ect. Sorry for the confusion, but I've been trying to get the word out and I have a bunch of threads in different forums I'm responding to. I'm trying to come up with the best way to explain it, but since it doesn't really make any sense the way they set it up to work anyway, it's proved difficult. The best explanation I can offer is that when you use a PC registration, your account gets a certain status associated to it. If you bought the SE or the CE the system recognizes which one you have and stamps your account with that status. Think of it as a one time process that can't be overwritten. The moogles remember who you are and what goodies you deserve. PS3 on the other hand uses promotional codes. This system doesn't care which version of the game you're using because any of the in-game items as well as the early access are all granted by applying promotional codes to your account. PS3 moogles take promotional codes as bribes to get goodies because they recognize all PS3 users as having the same account type.